With Congressional approval of the Great Lakes Compact out of the way, Governor Doyle says the hard work can begin. The Compact received final passage Tuesday in the U.S. House and President Bush is expected to sign it. 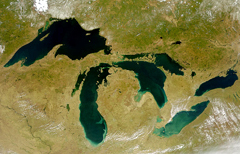 Governor Jim Doyle says it will provide the framework needed to protect the Great Lakes by allowing states and Canadian provinces to work together to manage them. Doyle says there are many issues to address, such as the dumping of ballast water by cargo ships. He hopes the Compact can lead to a standard national rule on the issue. Doyle says there also needs to be a renewed focus on other environmental issues impacting the Lakes, such as air quality. Doyle says the Compact will help to restore fisheries in the Great Lakes, but mercury emissions and other pollutants that can impact the waters also need to be controlled. The Governor wants to see limts, such as a DNR rule that would reduce mercury emissions by 90-percent.